Global Travel Media » Blog Archive » ILOVERIO.COM and Rio de Janeiro State Department of Tourism in partnership, and preliminary official August tourism statistics released. ILOVERIO.COM and Rio de Janeiro State Department of Tourism in partnership, and preliminary official August tourism statistics released. Starting this week, 6000 custom gifts will be distributed at the Rio Media Center and Espaço Rio, reaffirming the partnership between Rio de Janeiro State Secretary of Tourism Setur-RJ/TurisRio and the portal I Love Rio. The promotional material, produced by Setur-RJ, will be delivered along with an ecobag and a squeeze, made by ILoveRio.Com. The printed material will include the Rio+3 Guide, showing cities located up to three hours away from the capital, and z-cards (small pocket maps of Rio de Janeiro state). One of the purposes of the I Love Rio Portal is to convey to the world the feelings of pride and love that Brazilians have towardsRio de Janeiro, while showing the state capital and the State of Rio in a complete and innovative way. “A multicultural look at Rio de Janeiro” – this is the differential in the design of ILoveRio.Com that, through a poetic and playful vision, provides specific characteristics and details about attractions, habits and traditions of the residents of the State of Rio. According Nilo Sergio Felix, Tourism Secretary of the State of Rio de Janeiro, this unique look of the ILoveRio.Com team was key to the partnership with Setur-RJ / TurisRio. Designed for tablets, the Portal provides thousands of direct links to local establishments such as bars, hotels, restaurants, government institutions and companies. In addition to the main portal in English, the project includes websites with content in 70 different languages. 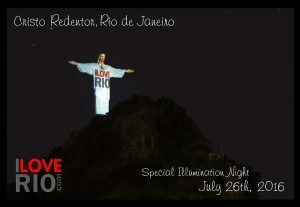 I Love Rio.Com was officially announced at an event at the Christ the Redeemer Monument, on the night of July 26th 2016, with a special illumination and a blessing. ILoveRio.Com, and independent project, received the support of several institutions references in tourism and culture, including Embratur, the Department of Culture and TurisRio, in addition to endorsements by 16 cities in the state of Rio de Janeiro, such as Armação dos Búzios, Paraty, Petrópolis and Macaé. On August 18th 2016, at a presentation attended by the ILOVERIO team, preliminary statistics about Rio2016 were released by the Ministry of Tourism and can be accessed on the link https://iloverio.com/pdf/17_08_16_apresentacao_pesquisa_mtur.pdf, along with the introductory note to the press accessible on the link https://iloverio.com/pdf/17_08_16_nota_apresentacao_pesquisa_mtur.pdf.